One of the buildings on the grounds of the Tuvkhun Monastery. 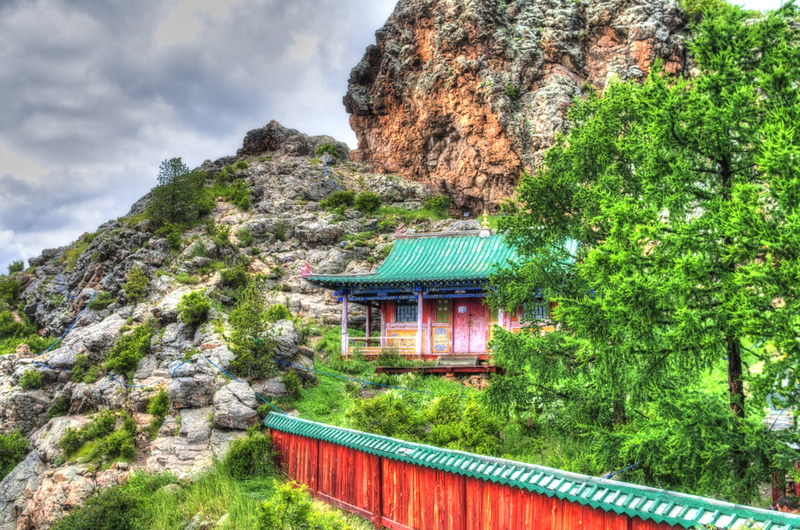 This is one of the oldest monasteries in Mongolia, dating back to 1648. While it has been destroyed and rebuilt throughout its history, with the most recent restoration in 1997, it looks much older. The paint has aged and faded unevenly throughout the fences and walls of the buildings. This hermitage is located inside the Orkhon Valley Cultural Landscape, which is designated as a UNESCO World Heritage Site. Despite this designation, it would appear that it doesn't get a lot of visitors - or perhaps it was just due to the rain that day. Mongolia is one of those countries that is just filled with natural beauty that I hope to make it back to someday for a longer trip.